[Roberto Barrios] has a Korg Triton sampling keyboard which he enjoys very much, but has grown tired of using media of yesteryear to store his work. He had the option of floppy disk or Jazz drive and for a time he was using a floppy-to-USB emulator, but the keyboard still insisted on a 1.44 Mb storage limit using that method. He decided to crack open the case and add his own CF reader. It should be noted that this hack could have been avoided by using the 25-pin connector on the back of the keyboard. He didn’t want to have external hardware, which is understandable if you’re gigging–it’s just more equipment to keep track of. 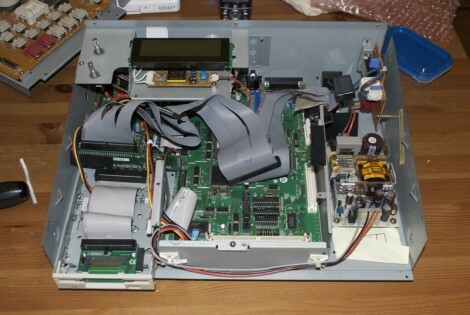 His solution uses the floppy disk drive opening to mount the card reader. His electrical connections are made with a ribbon cable. He cut off one end, and soldered the individual wires to the contacts on the motherboard. 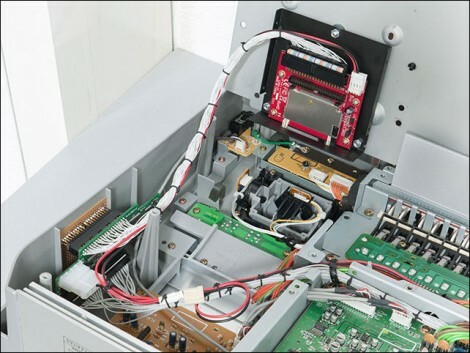 The reader is seen as a SCSI drive by the Korg firmware thanks to a SCSI-to-IDE adapter, so the storage limitation is based quite fittingly on the size of the CF card used. Look at that cable management. You’d think it came straight from the factory like this! [Shoji] has a beloved sequencer that went out of production ten years ago. Unfortunately the storage options are also 10 year out-of-date as SCSI is the stock option for storing his loops. Using a series of adapters he added Compact Flash storage to his Akai MPC-2000 Classic. The board has a connector for 25-pin SCSI which he wired to a 25-pin to 50-pin SCSI adapter. From there he connects a SCSI to IDE board, and then an IDE to CF. Subsequent versions of the Akai Classic have floppy drives in the front left corner so he used this method to mount he CF slot. Now he’s got plenty of storage with very little change to the appearance of the looper.